The US Department of Justice said the banking industry has displayed “breathtaking flagrancy” by intentionally toying with international markets, and exploiting the merest gaps in technology for massive personal gain. A stunning series of guilty pleas came from four of the banks: Barclays, RBS, Citigroup and JP Morgan. Bank of America was also fined by the US Federal Reserve. A total of five banks were fined a sum of $US5.7 billion between them. Swiss bank UBS was given immunity as it was the first to report the manipulation of the foreign exchange markets, though it did admit to wrongdoing in other offences. US attorney general Loretta Lynch said the guilty bank traders set up a group they called “the cartel” to manipulate the market between 2007 and the end of 2013. 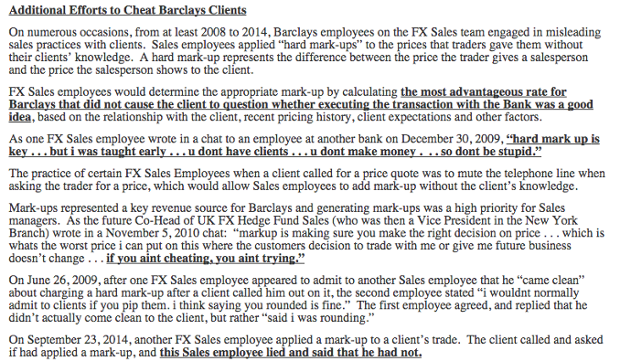 The bankers colluded with rivals and used encrypted chat rooms to manipulate rates. In one chat session, a trader referred to himself and fellow participants as “the three musketeers” and said “we all die together”. “They acted as partners - rather than competitors - in an effort to push the exchange rate in directions favourable to their banks but detrimental to many others,” said Ms Lynch. Traders in Cartel chatroom agreed to withhold bids or offers for Euros or dollars at specific times – the seconds during which trading freezes and a market ‘snapshot’ is taken, twice a day - to protect each other's trading positions. The banks involved represented at least a quarter of the trillions of dollars worth of dollar-euro transactions each year, and “were uniquely positioned to manipulate the market”, according to assistant attorney-general Bill Baer. Individual traders have been sacked form a number of the banks. JPMorgan went so far as to suggest its role was limited to a single employee. “The lesson here is that the conduct of a small group of employees, or of even a single employee, can reflect badly on all of us, and have significant ramifications for the entire firm,” said JPMorgan chief executive Jamie Dimon. Professor Andrew Spicer from the Cass Business School at City University London has written a piece for The Conversation detailing the case and describing the intuitional elements in the banking community that let this sort of thing happen. 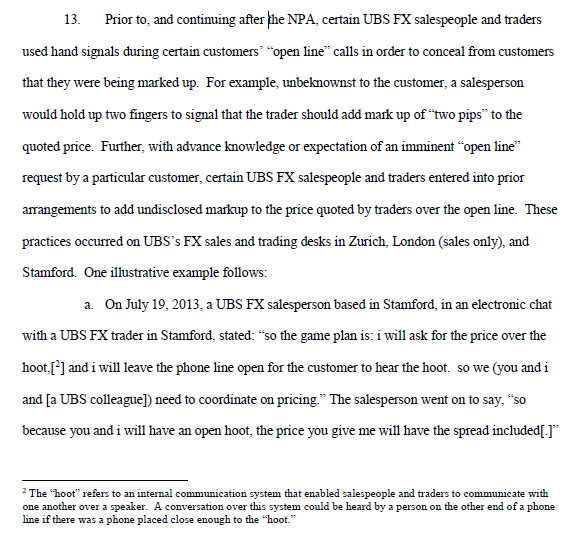 Below are some of the documents used in the most recent case, which talk about the collusive behaviour, open desire to rip off the forex market, and even the use of specific hand gestures and codes to do so.